Our products that relate to one of the four seasons: spring, summer, autumn and winter. You can access each season directly using the menus. Product Description: Embellishments with shapes of 2 pieces swimsuits. Dress-It-Up Ref. : 2246. To be used in craft, scrapbooking, card making, patchwork and general sewing projects. Content: 12 embellishments, in 2 models with different colors. Diameter: 20 mm. Material: Plastic. Product Description: Embellishments with shapes of mittens.Content: 8 embellishments, in 2 models and 4 different colors.Material: Plastic.Diameter: 23mm. 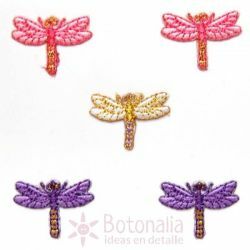 Product Description: Embellishments with shapes of flowers. Referencia Dress-It-Up: 4708.To be used in craft, scrapbooking, card making, patchwork and general sewing projects.Content: 8 embellishments of the same model, in different colors.Diameter: 26 mm.Material: Plastic. Product Description: Decorative buttons with shapes of violets. Content: 9 buttons of the same models and different colors (there can be variations in the colors) Diameter: 18mm. Material: Plastic.